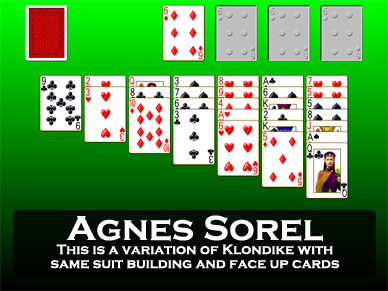 Screen shot of the game Agnes Three from Pretty Good Solitaire. 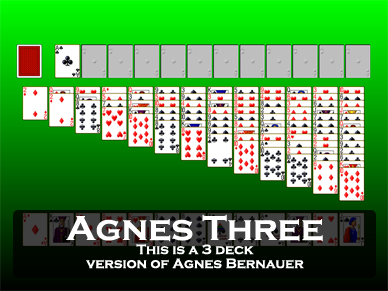 Agnes Three is new three deck solitaire game based on the old game Agnes Bernauer. 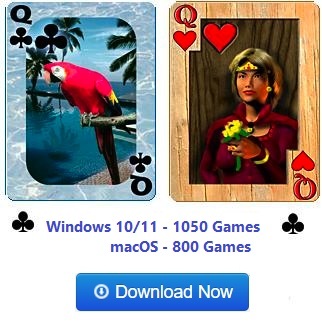 At the start of the game, the cards from three decks are dealt out to 13 tableau piles, one card to the first pile, two cards to the second pile, and so on up to 13 cards to the 13th pile. All the cards are dealt face up. 13 more cards are dealt out to 13 reserve piles, below the tableau piles. 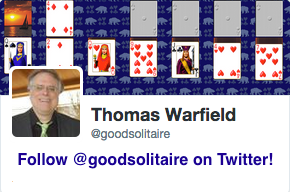 One card is dealt to the first foundation pile, to become the foundation base card. The remaining foundation piles will be built up in suit from the rank of this first card dealt to the first pile, wrapping from King to Ace as necessary, until each of the 12 foundation piles contains 13 cards, winning the game. The remainder of the cards form a stock. Building in the tableau is down by alternate color, and groups of cards in sequence down by alternate color can be moved together. Empty spaces in the tableau are filled by a card or group of cards headed by a card of rank one rank below the foundation base card (Kings if the base card is an Ace, if the base card is an Eight, then spaces are filled with Sevens). The top card of each reserve pile is available for play on the foundations or tableau. When stuck, deal one more card to each reserve pile (13 cards total) from the stock. There is no redeal. 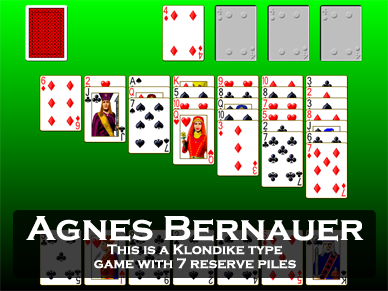 The play in Agnes Three consists of building runs of cards in the tableau and exposing as many of the buried cards as possible. It is also necessary to play as many of the cards from the reserves as possible to the foundations or tableau so that they do not get buried under the new cards dealt to the reserves. Avoiding blocks where cards get buried in the tableau or reserves is the key to victory.